It's an unbelievable deal! 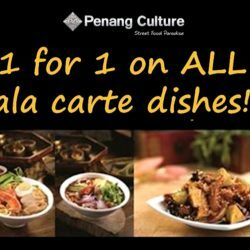 From 27 March 2017 to 2 April 2017, Penang Culture @Causeway Point will be offering a 1 for 1 deal for ALL ala carte dishes. Yes, ALL ala carte dishes!